Pre-order Paul Dempsey solo album now! 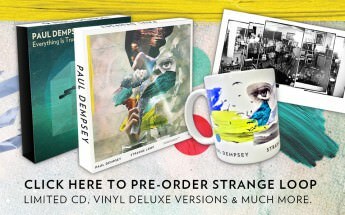 You can now pre-order Something for Kate frontman, Paul Dempsey’s brand new album, Strange Loop, in various limited edition formats; limited editions of the album on double vinyl, plus for the first time ever Paul’s first solo album, Everything is True, on double vinyl, a box set containing both vinyl albums, CD’s, mugs, tea towels and more! All items are limited & vinyl comes with a digital download card. If you pre-order the album from iTunes (Australia only) you will receive a free download of the opening album track, ‘The True Sea’ instantly. Pre-order from HERE.